Very small first and second leaves of emerging crabgrass can be seen now in open turf areas. During the last couple weeks, we have seen crabgrass emerging from open turf areas that were previously infested with crabgrass. Crabgrass emergence will probably occur later than this on better maintained turfs with a dense canopy. If crabgrass is emerging, it is too late for most preemergence herbicides to be useful. However, dithiopyr (trade name Dimension) is a commonly used preemergence herbicide that also provides effective postemergence control of crabgrass (but not goosegrass). For postemergence control, dithiopyr should be appliedto 1- to 4-leaf stage crabgrass (see the label for detail on application rates). Tillered crabgrass will not be effectively controlled by postemergence applications of dithiopyr. 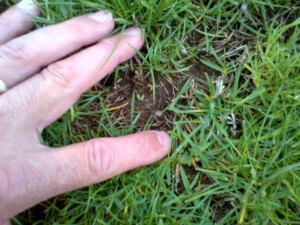 Also note that reseeding must be delayed for 3 months following application of dithiopyr. Dithiopyr applications made now (late May) requires that any overseeding of treated areas must not be done until late August. Other postemergence options include fenoxaprop (Acclaim Extra) and quinclorac (Drive). Fenoxaprop is safe on perennial ryegrass and tall fescue. Fenoxaprop may stunt rapidly growing Kentucky bluegrass and can only be used at low rates on bentgrass. Fenoxaprop controls crabgrass, goosegrass, and other annual grass weeds. Apply when crabgrass is just above the turf canopy (usually early July), but prior to the time when weeds have developed 4 or more tillers. Quinclorac may be used in established Kentucky bluegrass, perennial ryegrass and tall fescue (see label for details on rates). Quinclorac should not be used on 100% fine fescue turf; label instructions allow use on mixtures containing fine fescue. Quinclorac will control young untillered crabgrass as well as mature, multi-tillered plants. However control of crabgrass with one to five tillers is inconsistent. Unlike fenoxaprop, quinclorac has soil residual activity and will provide approximately 20 to 30 days of residual crabgrass control. Quinclorac will not control goosegrass. Quinclorac will effectively control clovers and most speedwells but is weak or ineffective against other broadleaf weeds. See Rutgers Cooperative Extension Bulletin E233 for more information on crabgrass and goosegrass control in cool season turfgrass.